1. 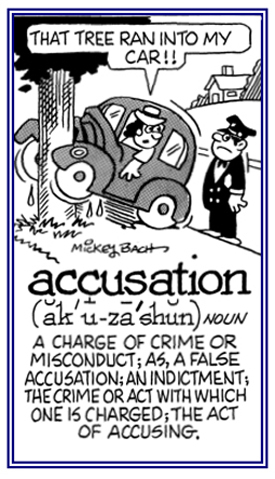 An assertion or allegation that someone is guilty of a fault or has done something illegal or wrong: There have been additional accusations of Harry's corruptions while he was serving as the mayor of the city. 2. A formal charge of wrongdoing brought against a person; the act of imputing blame or guilt: The police officer submitted his report which included the accusation that the driver was exceeding the posted speed limit. 3. Etymology: from Latin accusatio(n); from accusare, "to call to account"; from ad-, "toward" + causa, "reason, motive, lawsuit". © ALL rights are reserved.